I have discovered over the years how much I truly love vegetables. For those of you who don’t know, I gag over mashed and baked potatoes. I guess its the mushy, soft texture that gets to me. I can’t say I truly hate potatoes though, because I LOVE oven-roasted potatoes!!! In my opinion, Brio Tuscan Grille has the absolute BEST oven roasted vegetables in the entire world. If you have not tried them, then you must! I went on my first date with my husband-to-be, Matt at Brio. The funny thing is, my mom and sister went on that first date with me. No, my family is not weird, or overly protective, it is just that I met Matt at church on a Sunday morning and he offered to take my family out to eat afterwards. Of course no one said “no”, so my mom and sister (my dad was out of town), ended up at Brio on my date with Matt! As most of you know, my husband is a pretty talkative guy…not a shy bone in his body. At the end of the date, I was clueless as to if he liked me or not. At that point, since Matt had been so friendly by telling us so many intriguing stories from his college days, I thought he was just being nice and was interested in becoming a member of our church, not date me. I sure liked him though! Long story short, within four months, Matt and I were sitting at Brio, this time ALONE, the night he decided to propose to me! Since Brio has such wonderful vegetables, I’ve been on the lookout for a substitute that I can make at home. 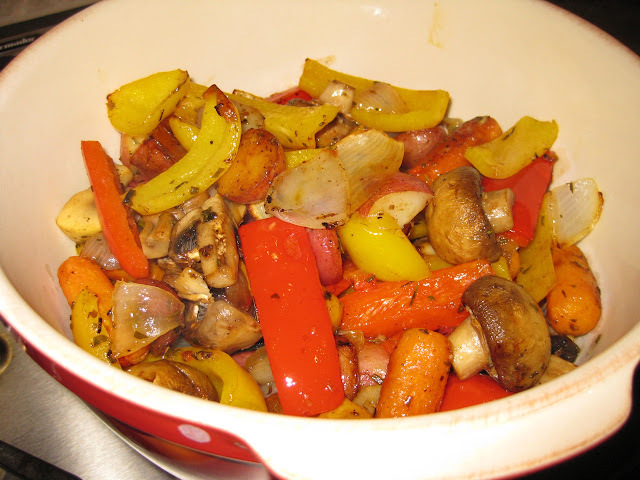 Well, these Oven Roasted Vegetables from the Houston Junior League cookbook are a close second! Brio’s vegetables are still my favorite because they are extremely crispy…just how I like them. This recipe on the other hand, gives off a wonderful aroma from the fragrant Italian seasonings that make these vegetables appealing to the pickiest of eaters. We omitted the eggplant because we didn’t have any, and substituted a yellow bell pepper for a green one. 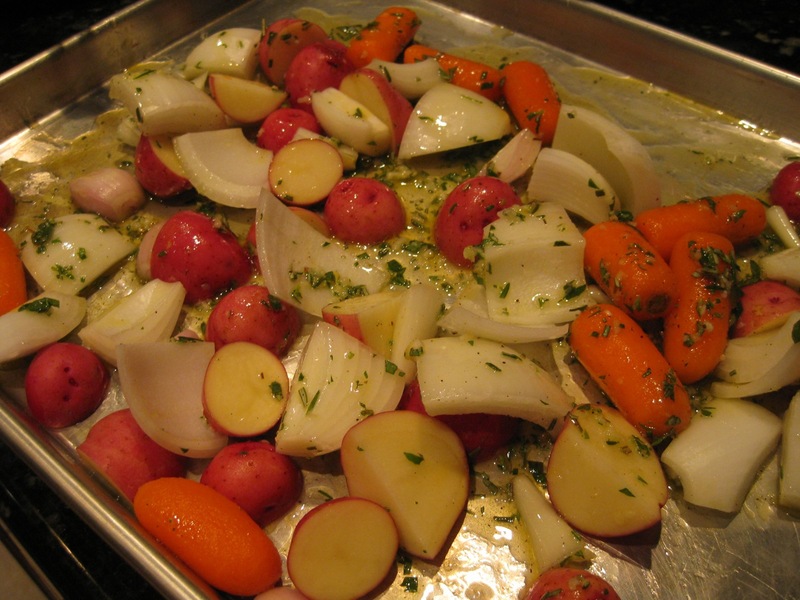 Use your favorite vegetables in this dish, and roast using the delicious olive oil drizzle. 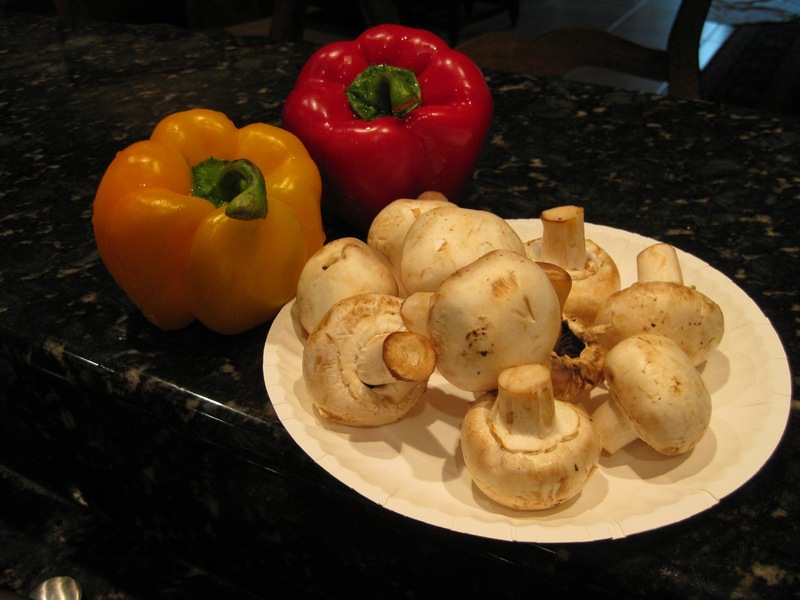 Red and Yellow bell pepper and fresh mushrooms. Combine the olive oil, lemon juice, garlic, and seasonings. Roast in a 450 degree oven for 20 to 30 minutes. Stir in eggplant, peppers, and mushrooms and roast for an additional 10 minutes. 2. Place potatoes, carrots, and onions in a 9 x 13-inch baking dish. 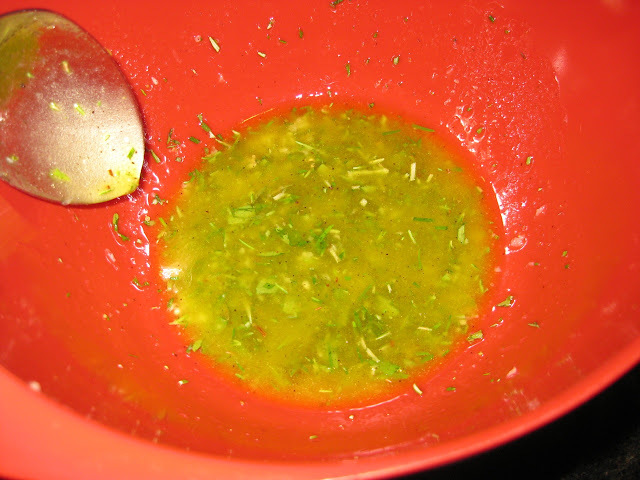 Mix olive oil, garlic, lemon juice, oregano, rosemary, salt, pepper, and lemon pepper in a small bowl. Drizzle over vegetables and toss. 3. Roast uncovered 20 to 30 minutes. Stir in eggplant, peppers, and mushrooms. 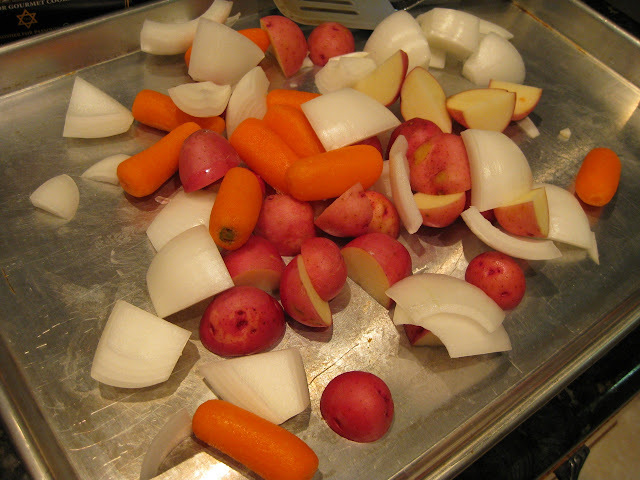 Roast an additional 10 to 15 minutes, or until tender. Stop and Smell the Rosemary: Recipes and Traditions to Remember; The Junior League of Houston, Texas. 3 Responses to "Oven Roasted Vegetables"
That’s great. I love the feedback. Let me know if you have any requests!